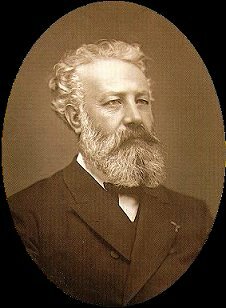 Jules Verne was born in Nantes and trained in law, Verne may not have been the first science fiction writer (Lucian, Mary Shelley, and Edgar Allan Poe all having prior claims to that accolade) but he was certainly the first to explore the genre systematically and to make a fortune from it. Although he must have been familiar with the enthusiasm of his Parisian contemporary Flammarion for the possibility of life on other worlds, Verne barely touches upon the alien theme in his novels. The one minor exception is to be found in his only extraterrestrial venture, From the Earth to the Moon (1865) and its sequel Around the Moon. In the latter, he exploits Hansen's hypothesis that the Moon's far-side has an atmosphere, water and, possibly, life. His astronauts glimpse "... real seas, oceans, widely distributed, reflecting on their surface all the dazzling magic of the fires of space; and, lastly, on the surface of the continents, large dark masses, looking like immense forests ..." In other respects, his lunar novels remarkably presaged Apollo, even to the extent of describing a three-man crew, a Florida launch site and a splashdown point in the Pacific just three miles from where Apollo 11 landed. All Verne's early novels captured the Victorian enthusiasm for science and technology, though the optimistic ideology in them may have stemmed more from the urging of Verne's publisher, the commercially-minded Pierre-Jules Hetzel, than Verne himself who seems by nature to have been a techno-skeptic. See also science fiction involving extraterrestrials, up to 1900.